Are you required to take one of the tests? How do you feel about logic puzzles and problem-solving? What are your thoughts on science-y stuff? Do charts and graphs make you smile? Are you addicted to your calculator? How much do you rely on process of elimination math? How confident are you in math? Is hunting for answers in reading passages tough for you? Are you and English Learner? 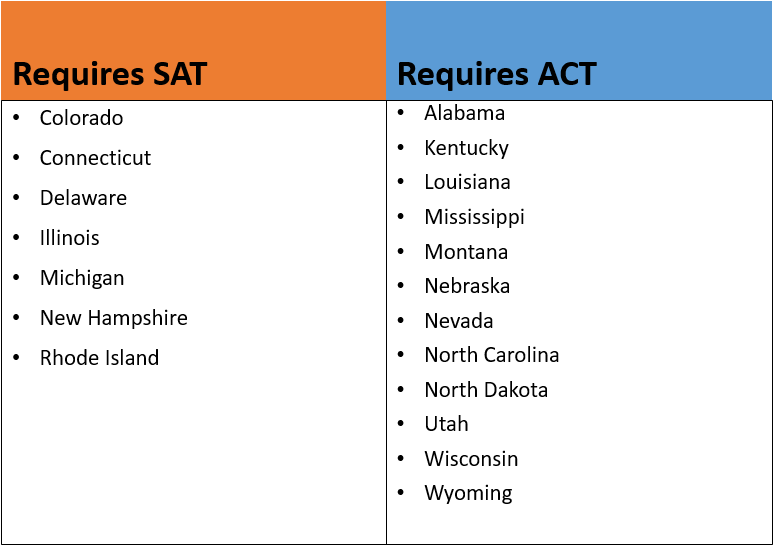 A lot of other states or school districts require the SAT or ACT, but policies vary. 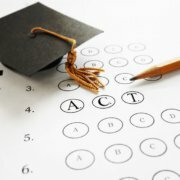 If your school requires that you take one of these tests, then your choice isn’t between the SAT and the ACT but between taking only the one test your school requires and taking both tests (which is totally an option!). Assuming that you have a choice to make, let’s look at some differences between the tests that might make one test a better choice than the other. The SAT gives you more time per question than the ACT does, so if you don’t read very fast, the ACT might not be the right test for you. The ACT is much faster-paced, so if racing against the clock is a big challenge for you, think about sticking with the SAT. If you love geometry, the ACT might be the test for you! About 1/3 or more of the ACT math section is geometry, compared with about 10% of the SAT math section. Plus, the SAT math section gives you a geometry cheat sheet with formulae, but the ACT math section expects you to have all that info memorized. If logic is your thing, the SAT might be the better test for you. On both the reading and the math sections, ACT questions are a little more straightforward whereas SAT questions often require a few extra steps of logic to arrive at the right answer. If you’re good at visualizing math problems and drawing logical conclusions from reading, then you might be well-suited to the SAT. The ACT has a whole section dedicated to science-y stuff, so if you like reading scientific materials, that might be the test for you. Make no mistake: The SAT includes science-y stuff, too. But it’s a lot less concentrated and makes up a much shorter portion of the test. The SAT science passages also make up less of your score—about 1/8 of your total score on the SAT versus ¼ for the science section on the ACT. Both tests require a good bit of data interpretation, but the ACT has a little more emphasis on this particular skill thanks to the Science section. The ACT Science section can more accurately be described as scientific reading with graphs and tables—there’s a good bit of data interpretation involved. The SAT scatters charts and graphs throughout all sections of the test, so you’ll find some data interpretation on the reading and writing sections, but it’s nowhere near as concentrated as it is on the ACT. Is your calculator a comfort object? Do you feel anxious without it? If so, the ACT might be the better choice for you. The SAT includes a calculator-free math section. 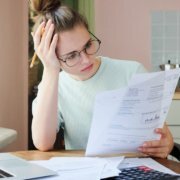 While all the questions in this section can be answered without relying on a calculator, those of you who cling to the calculator might not want to face this section. How much do you rely on process of elimination in math? If the process of elimination is one of your top math strategies, the SAT might be your better bet…or it might not. There are two differences at play here: one is the number of answer choices (ACT math has five answer choices while SAT math has four answer choices) and the other is the presence of grid-in questions on the SAT math section. Since the ACT math section has five answer choices, you’ve got a 20% chance of guessing correctly if you can’t eliminate any answer choices. The SAT gives you slightly better odds at 25%. So if you tend to guess a lot, the SAT might be your better option. However, this difference might be balanced out by the SAT math section’s grid-in questions. On these questions, you have to write in your own answer—you can’t eliminate your way to a good guess. If you love math and you know you’ll score better on math than on the verbal sections, the SAT is probably your better choice. On the SAT, the math sections make up half of your total score, but on the ACT, the math section only makes up a fourth of your total score. If math is your strongest suit, try the SAT on for size. If you have trouble finding the right place in a reading passage to answer a particular question, you might want to stick with the SAT. The SAT places reading questions in chronological order, so it can be easier to spot the right place in the passage to help answer the questions. The ACT doesn’t put the reading questions in any particular order, so it can be more challenging to find the relevant parts of the passage. Read more on acing the ACT English section. The ACT is somewhat more generous in granting test accommodations to English Language Learners (ELL). If you are enrolled in an ELL/ESL program through your school, you would likely qualify for EL accommodations on the ACT. You can only get these accommodations on the SAT if you’re taking the SAT during the school day, which is usually only common in states that require the SAT of all students. So…which test should I take? The ultimate test of which test to take is…to take both tests. 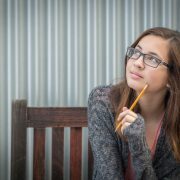 Some students have a natural affinity for one test over the other, and the best way to figure out whether you’ll perform better on one test over the other is to take a full-length ACT and a full-length SAT. Take these tests on different days so that you’re just as fresh when you take each test. Compare your scores—if you scored much higher on one test than the other, there’s your answer. And if your scores are about the same, pick the one you enjoyed the most (or hated the least)—colleges will take scores from either test. Once you’ve decided which test you are going to take, it’s time to start prepping. We have plenty of SAT and ACT prep tips in our blog, but if you want personalized test prep that will really help you score big on test day, then contact your local C2 center and receive a free practice test and consultation.